Mobile ticketing within the bus market has been commonly deployed using a visual ticket, which is similar to a paper ticket but uses a series of digital cryptographic anti-fraud security measures. There are three key benefits of this approach; Firstly, using visual mobile ticketing is quick to deploy (Masabi recently launched with National Express Bus in 7 weeks using our off the shelf core platform). Secondly, it involves minimal up front cost and finally, it can be overlapped into existing ticketing systems meaning integration is minimised, if required at all. Low cost and quick to deploy - what’s not to like? However, where do you go once you want to progress to a scanned mobile ticketing solution? Visual mobile ticketing solutions should also include accompanying encrypted barcode tickets. You can then implement a bus validation solution that scan barcode tickets onto a dedicated device when boarding the bus, as fast as a smartcard. Scanning removes reliance on drivers checking tickets. Barcodes work on ALL smartphones with no configuration required. Encrypted dynamic barcodes are very secure. Scanned ticket validation minimises fare evasion. Validation data improves passenger insight, improving decision making. 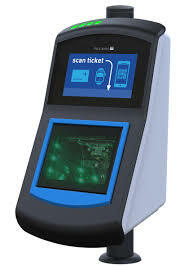 Transport providers need to plan ahead and develop a validation strategy that involves scanning or digitally reading tickets in some way, especially when mobile ticketing adoption increases beyond a certain level and need to select a vendor expert in delivering this. Not all barcodes are made equal, however. Masabi’s barcodes use asymmetric encryption to secure ticket details within the barcode and dynamically change every one-to-five seconds to prevent screenshots. Having authored the UK’s interoperable standard for barcode travel on rail, RSP-6, Masabi is perfectly positioned to support bus operators’ move to digital validation. What should transport authorities and operators be looking for in barcode validation? Fixed Scanners should be capable of reading and validating a ticket within 350ms of the arrival of the ticket. The latest scanning devices combine multiple media types in a single touch point, including Barcode, EMV contactless, NFC, Bluetooth Low Energy and traditional Smartcard reading, so that agencies don’t have to pick one format and exclude the rest, but have a reader that makes the best use of what the passenger chooses to use. Is the hardware linked to the software? Are you locked-in to one supplier? Does your solution allow for multiple ticketing technologies to be installed or upgraded into the same device, so new ticketing technologies do not require new hardware? Are your validation devices tracked in real time so faults are picked up instantly and can be fixed with minimum disruption to passengers. At Masabi we are passionate about providing cost effective and future proof fare collection solutions to our clients. We are currently helping bus operators across Europe and North America implement and run their barcode based validation solutions. Over the last 8 years, with our partners Access IS, we have developed the JustRide Inspect Validator. This solution reads barcodes in under 350ms and is easy to upgrade to include multiple ticket scanning formats including, EMV, NFC and BLE. By separating software and hardware transport providers can implement a future-proof validation solution without being locked into one supplier meaning any change in software does not require a hardware change or vice verse. Click here to learn more about the JustRide Inspect Validation Suite.